Who says you can't make Indian food without oil??!?! 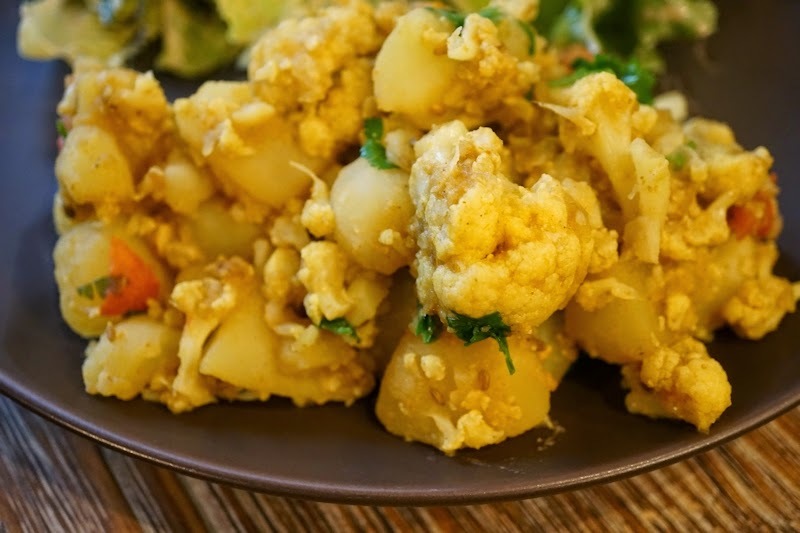 Aloo Gobi (Indian Potatoes and Cauliflower) made by my amazing husband! In a small bowl, mix the grated ginger, coriander powder, cayenne pepper, turmeric, and 3 tablespoons of water to make a paste. Heat the veggie broth in a large pot. Add cumin seeds and stir for a few seconds. Next, add the spice paste and stir for a minute until spices are combined. Add cauliflower, potatoes, 2 tablespoons of water and salt. Mix well. Cover the pot and let it cook on medium heat for about 15 to 20 minutes until the vegetables are tender. Make sure to stir gently every 3 to 4 minutes. If there is too much liquid, remove the cover to let some steam out. Lastly, add the freshly chopped cilantro and chopped tomatoes. Mix everything and cover for a minute. Adjust the salt to your taste. This looks so good! I'm going to try this soon!